Please contact owner Jerry at 205-903-zero six five six. Boat is located in Alabaster, Alabama. 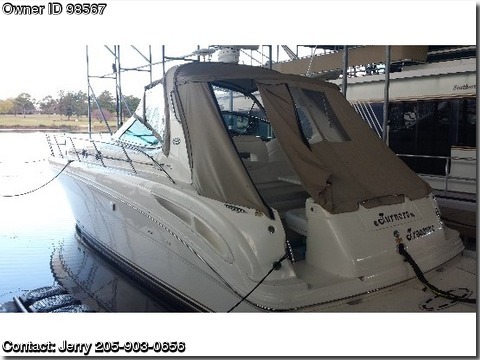 2002 Sea Ray 360 Sundancer,2002 Sea Ray 36 Sundancer.Mercruiser 8.1 Horizons.I have owned this boat for 7 years, it is a fresh water boat. She has been professionally waxed twice a year. Look at the pictures and you can see that we have kept this boat very clean. Also, notice how clean the motor compartment is!The 8.1 Horizons run perfect and the transmission shift effortlessly.She is currently at Goose Pond Marine with a perfect view of the golf course. http://goosepond.org/Full suite of Raymarine electronic, including a 72 nm radar and a RL70C Plus color chart plotter.The engine hours are 535 hours.The generator hours are 860 hours.TVs have been upgraded to a 19inch widescreen.Central Vac.The bottom has a barrier coat and was painted in 2013.The carpet in the cockpit was replaced in 2012.